Jingyan Wu completed her Ph. D. thesis research in the lab of Anita Hopper. Her dissertation research concerned the appropriate biogenesis and subcellular trafficking of tRNA, which are essential for decoding the genome and for regulating the proteome in response to nutrient availability and stress. Jingyan’s thesis goal was define the role of each and every gene in the yeast proteome in tRNA regulation, biosynthesis, subcellular dynamics, and turnover by employing a forward genome-wide genetics approach. Jingyan developed novel methods to propagate and isolate RNAs from ordered yeast collections (Wu & Hopper, Yeast, 2013) and used these methods, to screen 4847 yeast strains containing deletions of unessential genes and 808 temperature sensitive mutations of essential genes. Through these studies, Jingyan uncovered 162 (!) novel genes not previously known to function in tRNA biology (Wu et al. Genes Development, 2015, in press). These studies led to major discoveries including two potential new tRNA nuclear exporters (Wu et al., Genes and Development, 2015, in press), a likely mechanism for assembling the tRNA splicing endonuclease complex on mitochondria, and a mechanism to destroy tRNA free introns (Wu & Hopper, Genes Development, 2014), the by-product of tRNA splicing. Jingyan won numerous awards during her doctoral studies including travel fellowships to the XXIV tRNA Conference, in Chile (2012) and the 19th meeting of the RNA Society, in Canada (2014), an outstanding poster award at the Rust Belt RNA meeting (2013), a 1st place award at the OSU Molecular Genetics Scott Falkenthal Graduate Student Colloquium (2015), and a Pelotonia Graduate Fellowship for her dissertation studies (2013-2015). Jingyan is now postdoctoral scholar at Stanford University under the mentorship of Lars Steinmetz. Geethi joined the Slotkin lab in 2009 to investigate the roles of transposable element small interfering RNAs. She found that when transcriptionally activated, transposable element mRNAs are degraded into small RNAs via RNA interference, and that these subsequent small interfering RNAs can function in both gene regulation and the targeting of small RNA-directed DNA methylation. Geethi was a co-author of a book chapter in Plant Genome Diversity (Springer Press) and a co-author of publications in PLoS Genetics, The EMBO Journal, and RNA Biology. Most importantly, Geethi was the primary author of a 2013 publication in the journal of Plant Physiology that has been highlighted on the Faculty of 1000 website. In addition to her research contributions, Geethi was an outstanding teacher, mentoring many students in the Slotkin laboratory and as the Teaching Assistant for the course MG5601 – Eukaryotic Molecular Genetics Laboratory. Geethi is currently a post-doctoral researcher at the University of California Davis in the lab of Amparo Villablanca. 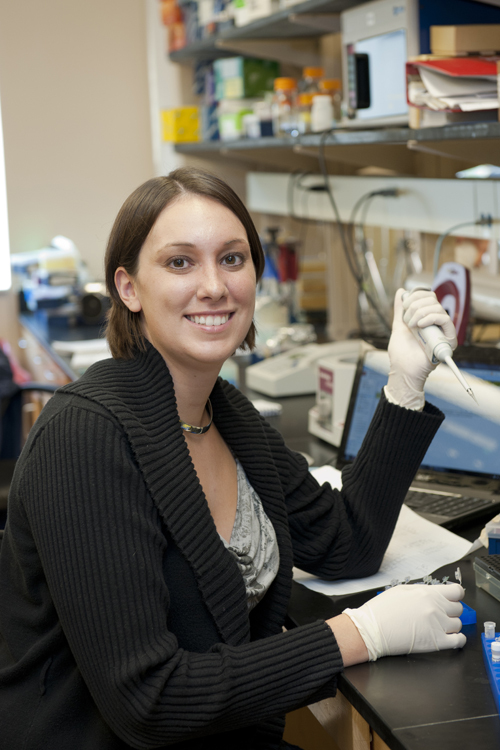 Andrea McCue joined the Slotkin lab in 2010. Her research focused on deciphering the mechanism of small RNA production in Arabidopsis, as well as the proteins required for small RNA-directed DNA methylation. 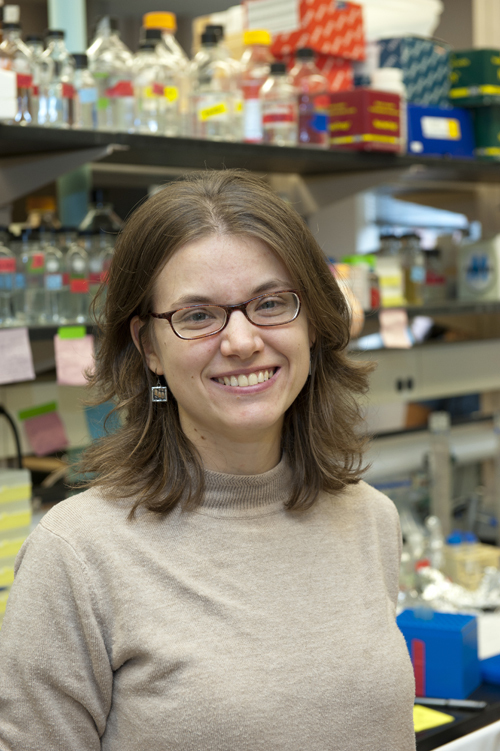 Andrea was the lead author of publications in PLoS Genetics, Journal of Experimental Botany, Trends in Genetics, RNA Biology and The EMBO Journal. In addition, Andrea was a co-author on publications in Genetics and Plant Physiology. Andrea received the Presidential Fellowship from Ohio State as well as a fellowship from the Ohio State Center for RNA Biology. Andrea was awarded the Ohio State Graduate School’s Louise B Vetter Award for Excellence in Research. Andrea is now a post-doctoral researcher at the National Institutes of Health (NIH) in the lab of Shiv Grewal. Valerie was supported by an American Heart Association predoctoral fellowship and The Ohio State University Elizabeth Clay Howald Presidential Fellowship, one of the highest Graduate School awards. She obtained travel awards to two international meetings. Moreover, she received first and second places for her presentations at the Scott Falkenthal Graduate Colloquium in 2010 and 2012. 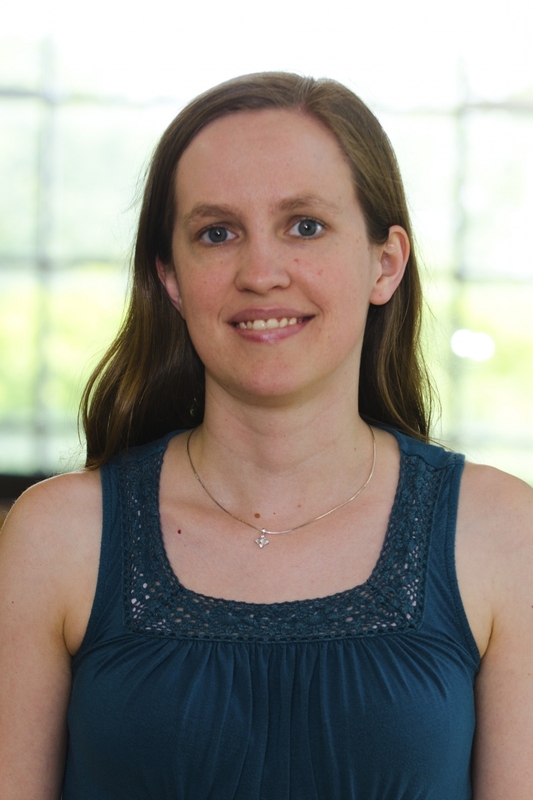 Valerie is currently a postdoctoral researcher in the laboratory of Adriana Dawes in the Mathematics and Molecular Genetics Departments at The Ohio State University, where she is adding mathematical modeling to her repertoire. 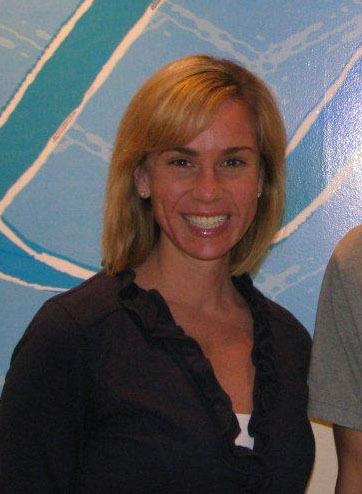 Monica Crary was jointly advised by Paul Fuerst and Greg Booton. Her thesis examined the phylogeny of Acanthamoeba found in recent outbreaks of ocular keratitis. Her work demonstrated that Acanthamoeba could harbor numerous bacterial pathogens, including Legionella. Monica was awarded a research grant from Prevent Blindness Ohio to support her research, and presented at both national and international meetings. In 2011 she received a special teaching award for the Molecular Genetics Department to recognize her role in the design and implementation of MG500. Monica is currently a Senior Scientist at Alcon in the R&D safety microbiology vision care group, where she is working to protect contact wearers from Acanthamoeba infections. Sara Cline completed her thesis in the lab of Patrice Hamel. She utilized a variety of genetic and biochemical techniques to examine novel genes that are required for assembly of photosynthetic complexes. Sara had a strong interest in combining her research career with teaching, and chose to teach at several levels during her time in the Department. She was awarded a Critical Difference for Women Professional Development Grant in 2007, and a Marianna Russell technology grant in 2008. She also received a University Graduate teaching award in 2012. After a one year visiting position at Eckerd College, Sara joined the faculty at Athens State University as an Assistant professor, allowing her to combine her loves of research and teaching. Onur Egriboz completed his thesis degree research in the lab of Jim Hopper. Onur mastered and applied a wide array of experimental approaches entailing yeast genetics/molecular genetics, recombinant DNA, protein purification and spinning disk confocal fluorescence microscopy to investigate molecular and cell-biological mechanistic elements of the GAL gene transcriptional switch in Saccharomyces cereivisiae. His work culminated in the discovery that one of the GAL gene switch regulators, Gal3, overcomes the action of another, Gal80, by competing with Gal80 self-association. As well, his work revealed Gal80 intranuclear clusters and Gal80 association with membrane lipids, two features that together with Gal3's action on Gal80 provide the underpinnings of completely novel hypothesis concerning how Gal80 might regulate the the transcriptional activator, Gal4. 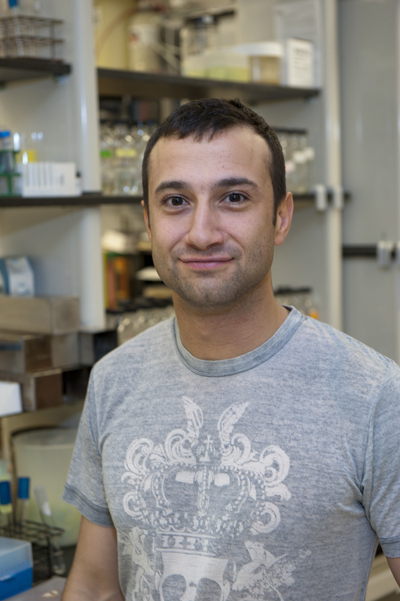 Onur is currently a post doctoral researcher focusing on the tumor microenvironment in the laboratory of Dr. Gustavo Leone of the Human Cancer Genetics Program and Departments of Molecular Genetics and Molecular Virology, Immunology and Medical Genetics of the Ohio State University. Maurisa Riley completed her thesis work in the lab of Susan Cole. She undertook projects examining the functions of the Notch signaling pathway during embryonic development. In collaboration with scientists at Children's hospital, she showed that missense mutations in the Notch receptor could affect Notch signaling and predispose embryos to develop congenital defects of the left side of the heart. She also completed a project showing that miRNAs could function in the post-transcriptional regulation of the Notch pathway during embryonic segmentation. During her time at OSU, Maurisa was supported by fellowships from the American Heart Association and from the Pelotonia foundation. She received first place for her presentations at the Scott Falkenthal Graduate Colloquium in 2011 and 2009, and in the Hayes Graduate forum in 2010. After completing an ACS-funded postdoc with Gigi Lozano at MD Anderson Cancer Center, Maurisa joined The Boston Consulting Group in 2015 as a consultant.